Payette is located in the southwestern corner of Idaho at the confluence of the Snake and Payette rivers. The city lies in the heart of the Treasure Valley bordered on the north and east by orchard and grapevine covered hillsides, traversed, by the crystal clear Payette River and bounded on the west by the mighty Snake River. Payette City comprises 3.6 square miles and has an elevation of 2150 feet. Payette is midlatitude (longitude 117° W. – latitude 49° N.) with a climate typical of the semi-arid regions of the west. Average annual precipitation is nearly eleven inches and the seasons are well defined. 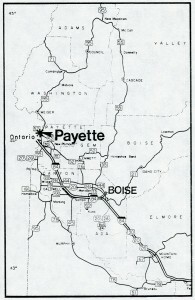 Payette is 386 miles east of Portland and 60 miles west of Boise. It is served by Interstate 84, U.S. 95, Idaho Highway 52, the Union Pacific Railroad, and the Payette Municipal Airport. 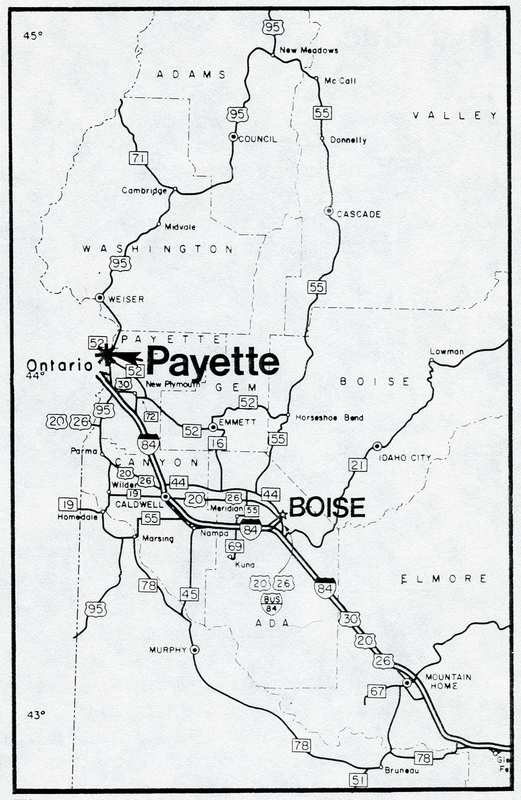 The surrounding cities and their distance from Payette are Fruitland (4 miles), Ontario, Oregon (6 miles), New Plymouth (13 miles), Weiser (14 miles), and Emmett (29 miles). The city of Payette has a 1980 population of 5,448 with the city serving as the county seat for Payette County. The area’s economic base is supported primarily by its livestock and agricultural industry.